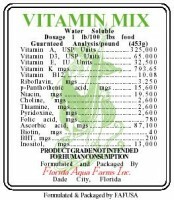 Formulated specifically to Florida Aqua Farms specifications. This same blend has been used by us for over 15 years. Water soluble, dissolves well with little residual. 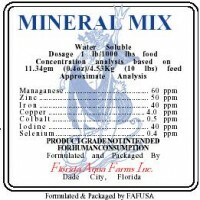 Good additive for those who blend their own feeds. 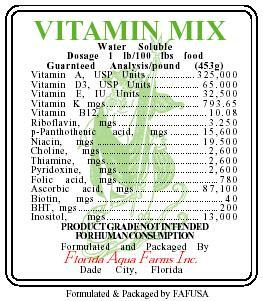 Average dosage for fish is 1 lb (453 gm) per 100 lbs (45.3 Kg) of food. Good item for enhancing freeze dried and flake foods. Simply soak just enough dried feed to soak up all the fluid to make them moist.